Your students will love the hip rock sounds from this fresh new group. 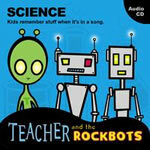 Teacher and the Rockbots is dedicated to producing educational songs that are entertaining, and never patronizing. Teachers and parents will appreciate the sound educational theory behind each song. Introduction • Animals Belong in Class • Where Will I Go? (Digestive System) • Food Chain • Water Cycle • Simple Machines • Electricity • Scientific Method • Complicated Machine (Human Organs) • Nine Planets • Things in Space • Lemonade Stand (Liquid Measurement) • Light • How's the Weather?